Let us support you in feeling integrated, whole, balanced and at ease. The health of our backs and spines can easily be something that we don't think about until we experience pain, tension or tightness. Our bodies are always speaking to us, giving us messages, and we come to have a baseline of what we experience as normal. What I love about Yamuna Body Rolling is that it provides me the opportunity to create more space, length, and opening in areas such as the back, neck & shoulders through simple & effective routines. Through feeling & experiencing we can begin to understand how parts of our body are connected. I see a massage therapist regularly and find that YBR maintains the benefits between sessions and allows me to continue to feel at ease a bit longer through taking care of my body & alignment. I continue to appreciate Yamuna's work so much in how I have tools on hand to relieve those areas of tension early on, maintain the benefits of bodywork between sessions, as well as address those chronic areas of tightening to create a lasting change. It was 5 years ago this week between Christmas & New Years 2012, that I stayed up late one night envisioning opening a yoga & yamuna body rolling studio. I imagined what it would feel like, the size of the classes being intimate, filled with natural light, and being a store-front location. I wrote this all down, including the types of classes I'd like to offer & even who I'd love to teach the classes. I wrote down Brenda's name & the very next morning I went to a yoga class & I ran into Brenda!! Brenda and I were really just acquaintances & knew each other through both being Yamuna Body Rolling practitioners in the area. So after class we chatted a bit about our yamuna body rolling classes & how there seems to be a need for a place with regular Yamuna Body Rolling classes. I was filled with surprise & excitement when she said, "We should open a studio!" The synchronicity was uncanny, and I had a feeling it would be a great partnership. We met for lunch & discussed what our vision was & we were on the same page! Each time we got together the studio vision & intention was becoming more clear, and we were getting more excited about creating this space to have weekly therapeutic yoga & Yamuna Body Rolling classes, specialty workshops & 1:1 therapeutic sessions. It took about 10 months of gestation for our brainstorming to become actualized. 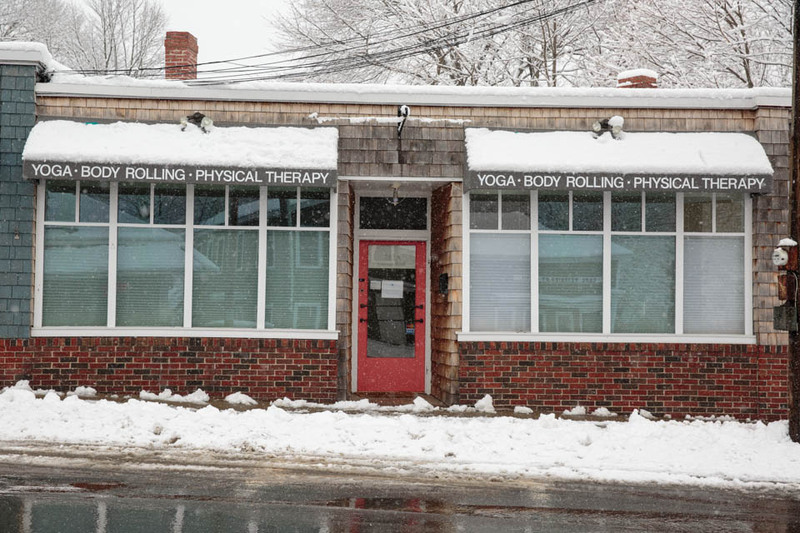 Brenda called me up one day and said, "I think I found our yoga studio" and we met down at 382 Cottage Road. As we looked around the space, it felt like the right fit. There was work that needed to be done, but we trusted our intuition that this was going to be our home base for creating a supportive space for healing, centering and therapeutic movement. So we signed the lease, and decided to open in a month & a half. In that short 45 days, we culminated all our brainstorming scratch notes into a business plan & obtained a loan. We consulted with Laura Gall who helped us optimize our space & bring to life our vision. She helped us narrow down paint colors, lighting, and the flow of the studio. Brenda and I, along with Pat and her boys painted the studio, patched holes, prepped & painted the wooden boards for the shiplap wall, and ripped up the floor and had a new floor installed, as well as had a custom bench made by our friend, Frawley Construction. We then got recommendations from our neighbor, Raf for the local woman he used to make bench cushions & pillows for us. How we all work together in a community, bringing forth our strengths and asking for help where we're not so strong is what keeps it all going around. What amazes me about the whole process of having a vision, to gaining clarity & intention, to bringing it into fruition & opening our doors, to keeping it going with consistency and presence is that at each stage we become more and more prepared to address anything that arises. We feel so fortunate to have attracted into our space a beautiful community of students & practitioners at all levels of practice & expertise over the last 4 years. It's because of you that we continue to love what we do, and feel our lives are enriched living with passion, presence and purpose. Each year after the busyness, fullness & celebration of Christmas, I like to take some time this week to slow down, reflect on the year, be gentle with myself, and allow my intuition to support me in creating a vision for the next year. Creating quiet time for reflection not only at the end of the year, but throughout the month allows me to gain a sense clarity & recognize things that I may otherwise overlook or not celebrate. In a society that tends to be go-go-go, I want to extend the invitation to you to also slow down and take some time to do something where you're intentionally reflecting on your year, noticing what in your life you're grateful for. Celebrating the up and perhaps learning a thing or two from your downs. What will 2018 hold for you? Emotionally, energetically, for your physical health, and for your overall wellbeing. Is there one thing you can add into your week that would support you in any one of these areas? Patricia Powers, a senior Yamuna Body Rolling teacher from NYC will be coming in to teach this training. This course is an incredible way to deepen your understanding of anatomy by actually rolling through each muscle specifically, finding the origin & insertion points and intelligently working into the body. Prerequisite: At least 4 hours of experience with YAMUNA Body Rolling. Register here to reserve your spot & to receive earlybird pricing! This course can be a stand-alone experience, even if you have no intention of teaching Yamuna Body Rolling. It's a wonderful way to learn more about how your body works & how to effectively create positive structural change for yourself. Yamuna Body Rolling: What is it and why should you do it every day? WHAT IS IT: Yamuna body rolling is a unique form of exercise using different size and density balls to tone, strengthen and realign your body. It is workout, a massage and alignment session all in one. STIMULATES BONE: Bones are vascular and increasing circulation can help with strengthening and maintaining bone health. With osteoporosis becoming more of a health concern as we age, taking care of our bones should be high on our list of body maintenance. INCREASES CIRCULATION: Our blood contains all of the nutrients our body needs to heal as well as removing toxins and lactic acid from our muscles. By increasing circulation we can heal old injuries and help prevent new ones. LENGTHEN FASCIA AND CONNECTIVE TISSUE: This translates to increased flexibility and less pressure on our joints. By improving our flexibility, we can help prevent injury as well as perform better in our sport or daily activities. IMPROVES POSTURE: By increasing flexibility, decompressing joints, stimulating bone and improving body awareness the overall result can be a dramatic improvement in posture. This can often result in significant decrease in back and neck pain, lessen tension headaches and maybe even make us a little taller. The best way to get started is to take a class or private session with a trained Yamuna Body Rolling Instructor. You can find one in your area by looking on www.yamunabodyrolling.com or locally at Willard Beach Studio. Take a group class 1-2x week at a local studio and/or purchase DVD’s and Yamuna balls to use for your home practice. Once you realize that YOU can maintain your own body and how much better your can feel, you won’t be able to stop. Back pain. Once we have lived to be "middle-aged”, it’s something very few of us haven’t experienced. I was unlucky enough to encounter it much sooner, in my twenties. My lifelong interest in movement and physical problem-solving led me to Pilates, and when I trained as a Pilates teacher I realized that the stronger my core became, the less often I felt back pain. But after having three children in five years, my back was hurting again. And the core-strengthening exercises of Pilates that had saved me before weren’t quite enough by themselves anymore. I still hurt. What more could I do? Enter yoga, an old friend I’d been out of touch with for awhile, and Yamuna Body Rolling, an elegant system that allows one to do for oneself what once only a skillful deep tissue massage could accomplish. (Nothing against a good massage, mind you). Once I had spent some quality time releasing and stretching muscles that pregnancy and the rigors of motherhood had sent into perma-spasm, I was able to return to my Pilates mat and strengthen what needed to be strengthened. Voila, chronic back pain again disappeared from my life. As an added bonus, I now have a bag of tricks for self care, ready for the next time back pain makes an appearance. For if I’ve learned anything in my years of working out and teaching, it’s that bodies, like cars, don’t stay fixed. They need maintenance and loving care to keep them running their best. But we are people, not cars; movement, sensations and emotions are intertwined in us. Maintenance that our bodies require allows us to function at our best. This ‘maintenance’ practice can feel wonderful to our bodies and souls, and has long-term benefits.